Mad Catz has a fine reputation in gaming peripherals - especially with its range of pro gamer mice such as the Mad Catz Cyborg M.M.O. 7. The F.R.E.Q range of gaming headsets have been designed to complement the pro gamer R.A.T devices, which are all bundled under the Cyborg brand. This is evident not only in the full stop-happy naming conventions of the products, but also the design of the headphones themselves, whose angular features mirror those of the mice. It won't be to everyone's tastes, but if you've already got a few Cyborg devices, then you'll find the Mad Catz F.R.E.Q. 7 Surround Sound Gaming Headset a nice fit. For example the silver scroll wheel on the headphones that alters the volume is reminiscent of a similar feature found on R.A.T devices. 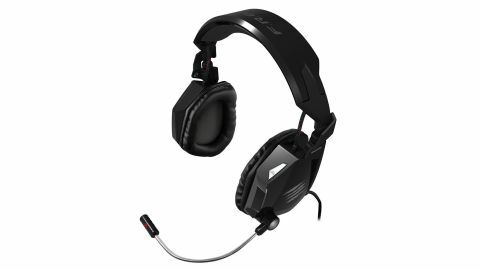 The ear cans are smaller than other gaming headsets such as the SoundBlaster Tactic 3D Rage, and they're not quite as comfortable to wear either. They're not wireless but the cable they come with has plenty of length so your movements aren't too restricted when wearing the headset. The USB cable also comes with a 3.5mm headphone jack for connecting to smartphones and other non-USB-equipped media players. The main selling point of the Mad Catz F.R.E.Q. 7 is, of course, the sound quality - especially in games. With Dolby Headphone 7.1 Surround Sound technology, combined with Dolby Pro Logic IIx, the headphones promise immersive surround sound, but do they deliver? While headphones reliant on digital technology to replicate surround sound are never going to compete with a multi-speaker 7.1 setup, the virtual surround worked pretty well - especially with ambient noises in games, which made for an immersive experience while sound quality on the whole was excellent. This is an expensive headset, yet the build and sound quality of these cans is excellent. While 7.1 virtual surround sound doesn't completely blow us away, it still makes gaming a lot more enjoyable.